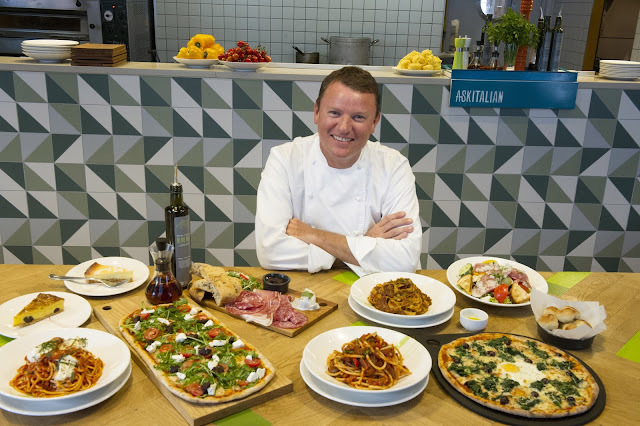 Last week, youngest and I were invited to a masterclass at ASK Italian Restaurant, Oxford Street with Chef Theo Randall to celebrate the launch of Ask Italian's new 2013 menu. The Italian inspired menu, created by expert friend Theo Randall and his team, was developed after numerous trips to Italy, and perfected through thousands of hours of testing in the kitchen. Part of the reason that the menu is so fantastic, and the dishes are so fabulous, is due to the vigorous research process, and the team's dedication to sourcing the best authentic Italian ingredients. 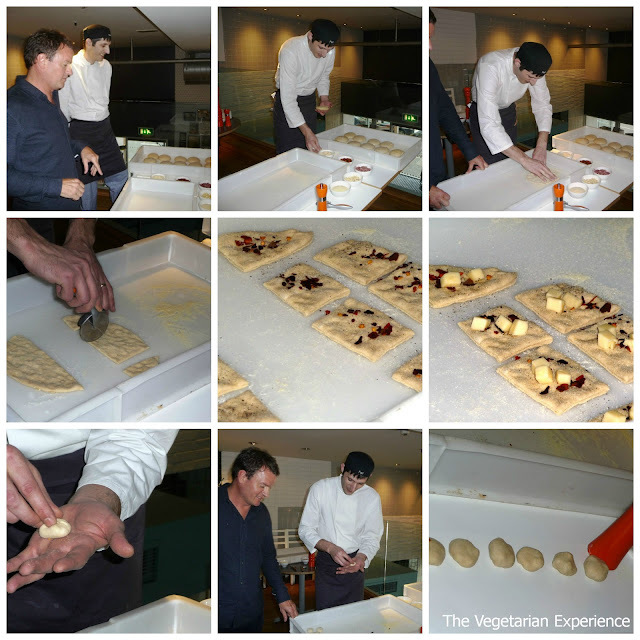 To kick of the afternoon's proceedings, Theo and Fari (Head Chef) showed us how to make Panzerottini - rather moreish dough-balls which Theo and the team discovered during their trip to the area around Campania, Italy. Originally filled with turnip tops, they have been adapted for the UK market to include a delicious vegetarian Chilli Cheese flavour, and a meaty Pancetta option also. After a demonstration, us bloggers were then given the challenge of copying Fari's amazing creations, and making our own Panzerottini. Youngest decided that she was eager to help, and so she and I got to work making our own Panzerottini. Unfortunately, it emerged that she was more interested in eating the ingredients rather than cooking with them. However, we did manage to produce some passable Panzerottini - although not to the standards of the experts I'm sure! After making our Panzerottini, we then sat down to eat the fruits of our labour. We were all surprised at how quickly the Panzerottini cooked - they only took a couple of minutes in the stove oven. The Panzerottini were served with the most divine Olive Oil - handpressed and sourced from local Italian growers, and balsamic vinegar poured into the olive oil. The Panzerottini were a great start to the meal. Even most of the carnivores admitted that they preferred the vegetarian Chilli Cheese Panzerottini over the meaty ones. To follow sampling the Panzerottini we had made, we then tested some dishes from the new menu, including an impressive, absolutely top notch Vegetarian pasta dish - Spaghetti al Pomodoro containing Santos tomatoes, fresh basil, and buffalo mozzarella. The Spaghetti al Pomodoro was seriously one of the best things I have eaten in a restaurant in a while. There was then another course of the new pizza's which were non veggie, but look amazing. Everyone was fit to burst! However, the meal wasn't over, and we were astounded when an awesome flour-less, gluten free cake called "Chocolate Amore" was bought over, closely followed by a dessert sharing trio consisting of Italian Cheesecake, Chocolate and Almond Cake, and Pistachio, Almond and Plum Tart, accompanied by the most delicious Alphonso mango sorbet - just divine! During lunch, it was very inspiring to hear Theo speaking about his trip to Italy alongside Italian food writer Carla Capalbo and the ASK Italian team to gain an insight into developing truly Italian dishes. Theo recounted visiting local growers, which helped us to really connect with the food we were eating. As a lover of the story of the journey from field to plate, I was especially interested to hear about exactly where my food had come from. Altogether, it was a thoroughly lovely afternoon! 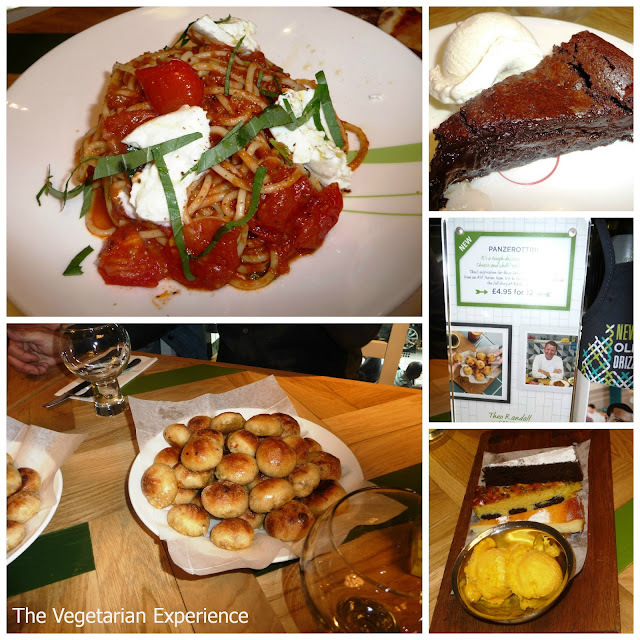 I love Italian food as it is very vegetarian friendly, and it is also mostly cooked using fresh ingredients and the flavour really portrays this in the dishes I sampled over the afternoon. I don't feel that I can write this article without acknowledging how supremely fantastic the ASK Italian staff at the Oxford Street restaurant were with youngest who is aged 3. They were so flexible in accommodating her, and arranged food and colouring for her to keep her occupied. 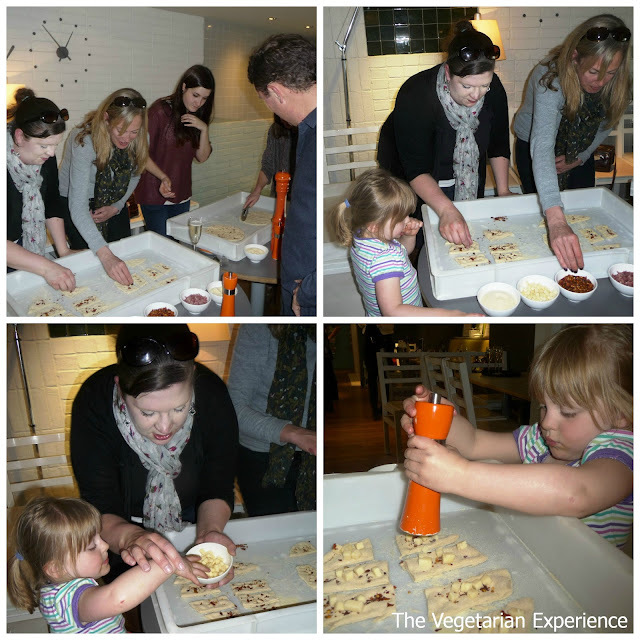 She also got involved in making the panzerottini, and felt very excited sitting with the grownups whilst we all ate. She would also remind me not to forget the impressive bowl of ice cream she devoured. She was extremely well looked after and catered for. I think as well as serving superb food for the grown-ups, ASK restaurants are also extremely family friendly, and it is one of the most welcoming restaurants for kids that I have ever come across (and we eat out a lot with kids). Youngest and I had a fantastic time finding out about the new menu. Thanks to ASK Restaurants for inviting us along. We will be back! Disclosure: Complimentary workshop and food offered in consideration for review. Interesting post Clare. Your breads look delicious and your youngest daughter is so sweet!